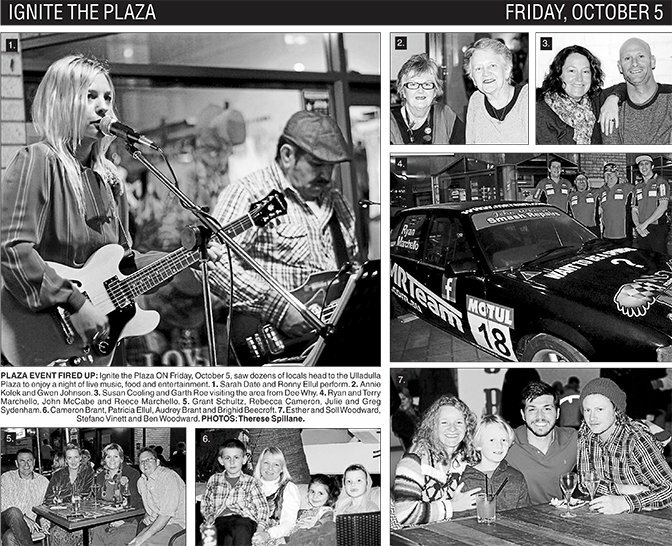 PLAZA EVENT FIRED UP: Ignite the Plaza ON Friday, October 5, saw dozens of locals head to the Ulladulla Plaza to enjoy a night of live music, food and entertainment. 1. Sarah Date and Ronny Ellul perform. 2. Annie Kolek and Gwen Johnson. 3. Susan Cooling and Garth Roe visiting the area from Dee Why. 4.Ryan and Terry Marchello, John McCabe and Reece Marchello. 5. Grant Schultz, Rebecca Cameron, Julie and Greg Sydenham.6.Cameron Brant, Patricia Ellul, Audrey Brant and Brighid Beecroft. 7. Esther and Soll Woodward, Stefano Vinett and Ben Woodward.PHOTOS:Therese Spillane.